Welcome to my Stamp It Demonstrator’s Group Easter Blog Hop. We’re all really excited to unveil our projects, and announce a new contest giveaway. To continue on your journey through our projects, simply use the BLOG HOPPERS links below. 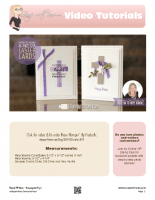 My blog hop project is this Easter Cross card set and how to video. Created with the Stampin’ Up Hold on to Hope and Crosses of Hope dies. Beautiful designs and easy to create. Perfect for all levels of stampers. In addition to my video for these cards, be sure to check out 2 of my previous “how to” video classes using these products. I’ll be sharing some more ideas at the end of the video. Here are the chapters of this online class video in case you’d like to skip ahead to a specific sections of the video. Beautiful cards, Tami. I absolutely love this stamp and die set. These cards are so pretty and perfect for the real reason for Easter! #stampitcontest Your Easter cards are beautiful. Just reminds me of the true meaning of Easter not all about bunnies and chocolate. Your Easter cards are beautiful. Just reminds me of the true meaning of Easter not all about bunnies and chocolate. I love the crosses. Such beautiful cards. Beautiful.. so classic/classy. Love them! Haven’t used this set in a while – thanks for the inspiration! Like the use of ribbon on the cross. I just love the Easter Cards. #stampitcontest ….Just watched you video and loved your cards! Always try to catch them when I can. Thanks for the inspiration!